Cinnamon roll cobbler with apple pie filling. This dessert mash-up is my new favorite! How do you spot a dessert genius? It’s usually in the flavor combinations. An infatuation with an upside down cake will lead a dessert genius to play around with the flavors and come up with something just a notch better, like caramel and ginger rhubarb upside down cake. And we all know that cheesecake is really just a jumping off point for balsamic, strawberry and lime cheesecake with a pine nut crust, right? This is common knowledge? (I’m kidding). That’s how I feel about Irvin Lin: dessert genius. Flavor combo wizard. Those flavor combos above are his creations. 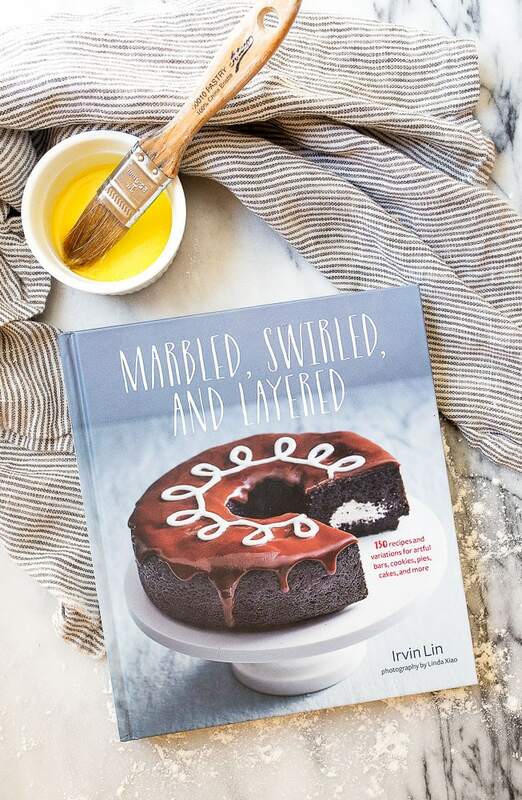 His latest book, Marbled, Swirled and Layered has incredible flavor combos and mash-ups. Irvin takes a classic dessert and swirls in something amazing. Or, he layers unique flavors together. He’s a magician, and I like when he feeds me. I had the absolute privilege to meet Irvin at one of his book signings a few months ago, and he brought dessert samples! I was the one that tried every single dessert…three times. His book is a compendium of impressive, artful and genius desserts. And usually, each recipe will have two or more flavor variations. I can just tell A LOT of baking went on to make this book. He’s a perfectionist when it comes to baking, and that’s a very good thing for a recipe developer. I spotted this Cinnamon Roll Cobbler on top of Apple Pie in his book, and immediately dog-eared the page. 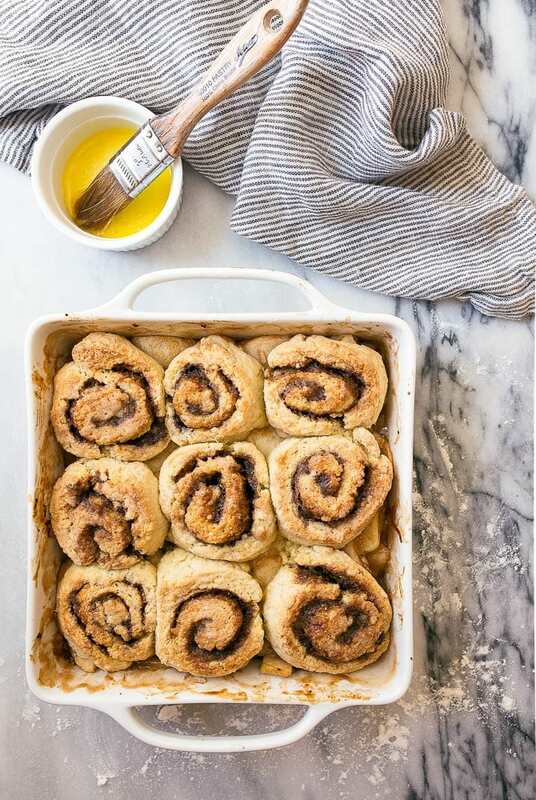 Why hasn’t anyone else combined apple pie with cinnamon rolls and cobbler dough? See?–dessert genius. Irvin’s recipe makes a full 9×13″ pan, but I scaled it down slightly to serve less (it’s what I do, you knew this). I didn’t scale it down too much, because apple pie is a favorite in my house, and I knew it wouldn’t last long, no matter the pan size. I liked the process of making this recipe. First, you peel and slice apples, and then toss them with spices and sugar. You pop them in the oven to start softening and cooking down while you make the cobbler dough. 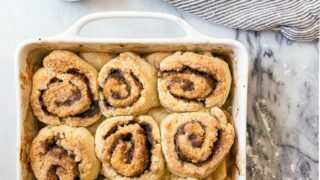 And just when your hands are doing the familiar thing of making cobbler dough, you pause, roll it out, cover it in cinnamon-sugar filling, and then roll it up. Use a pastry scraper to help you roll up the dough perfectly. You want those pretty swirls on top, yes you do! When the apples are half-way done baking, you plop the cobbler dough swirls on top, and finish the whole thing in the oven. It’s simple, but impressive. I mean, I ate half of the pan in 2 days. So, today, your new life begins. A life with apple pill filling with cinnamon rolls on top. Upside down apple cinnamon rolls. 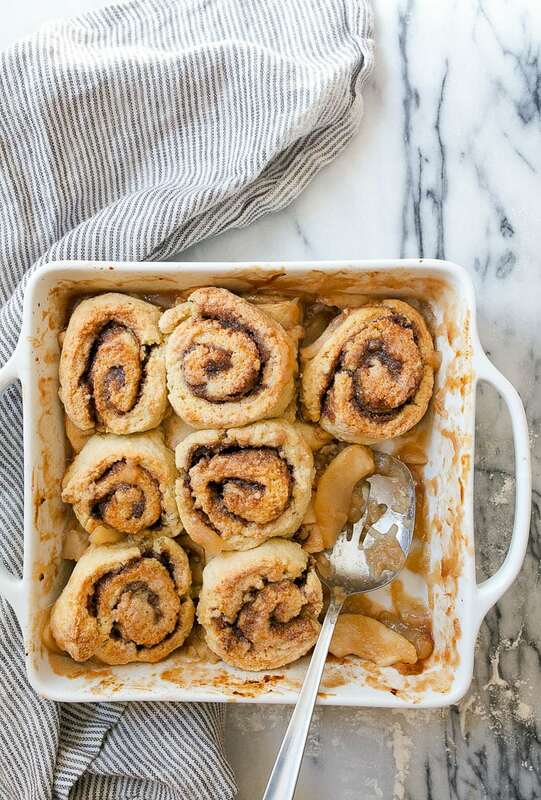 Apple cobbler with cinnamon rolls. Whatever you want to call it, it’s here to stay in your life. Thanks for making my life even more delicious, Irvin. I think you’re pretty great :) Let’s bake together soon! 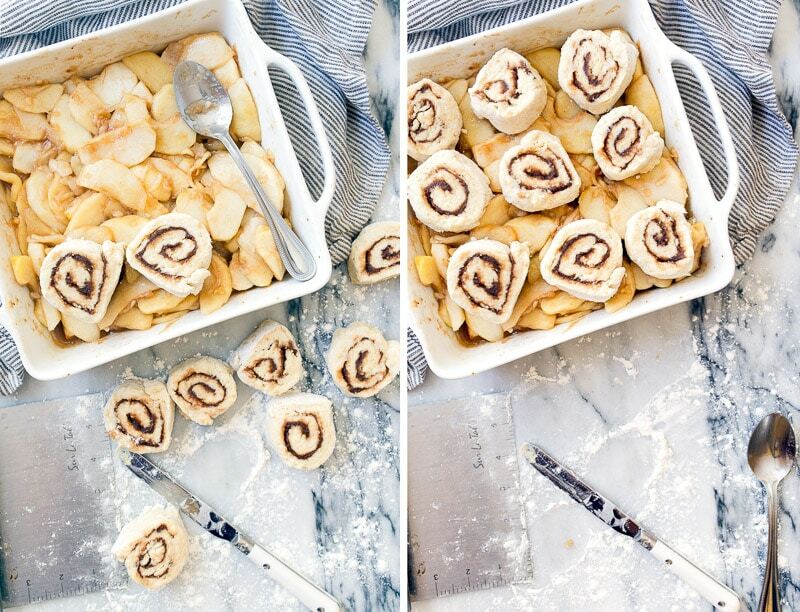 Apple pie meets cinnamon rolls. And no one is mad about it. Preheat the oven to 375. Spray a 8x8" pan with cooking spray, and set aside. Reserve 1 apple (any variety), and then peel, core and slice the other apples into 8 pieces each. Place the apples in a large bowl. Peel, quarter, and then grate the remaining apple, and add it to the bowl with the other apples. Stir in the brown sugar, cornstarch, cinnamon, salt and lemon juice until well-mixed. Pour the apples and any accumulated juices into the baking pan, and bake for 30 minutes. Meanwhile, make the cinnamon swirl filling: stir together the brown sugar, granulated sugar, cinnamon, melted butter and salt. Set aside. Finally, make the cobbler dough: stir together the flour, sugar, baking powder, baking soda, and salt in a medium-sized bowl. Add the melted butter to the flour mixture, and stir until well-incorporated. Finally, add the buttermilk. Stir until a shaggy, moist cobbler dough forms. Flour a surface very well, and place the cobbler dough on top. Roll out to a 9 x 9" square. Dust your hands and surface as necessary to prevent the dough from sticking. Spread the cinnamon filling on top of the dough, all the way to edges. It will be a very thin coat. Using a pastry scraper (see an example of one in the side-by-side photos), or just a blunt knife, begin to roll the dough up into a log. Go slowly and roll tightly! Cut the log into 9 slices, 1" thick each. Pull the apples out of the oven after 30 minutes, add the cobbler slices on top. Use the remaining melted butter to brush on top of each swirl (from the 'assemble instructions'), and sprinkle each roll with the sugar. Bake for another 30 minutes. 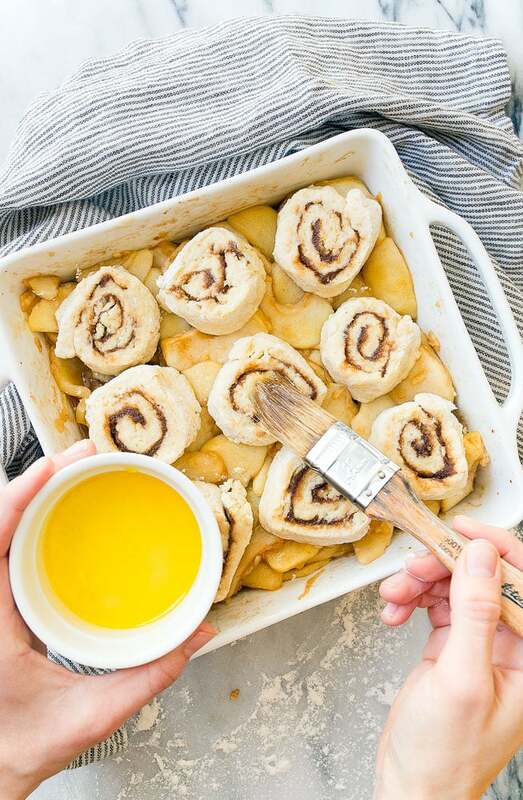 The swirls will be golden brown, and the apples will be bubbling and soft, and your kitchen will smell like an amazing mix of apple pie and cinnamon rolls. You're welcome. Comfort and Joy: Cooking for Two! Anything that has cinnamon rolls and cobbler in the name is my JAM. Dang girl dang! Whoa! This is a game changing dessert, so unique and fun! Amazing! I have dinner guests coming this weekend – this might just have to be made for that! You are posting some great ideas & recipes. Keep them coming! I’m new to your blog but will be watching from now on. Looks good but I need nutrition information to meet my goals in reducing different health issues. I like recipes for two people but don’t want leftovers. As you said, you ate half a pan in two days. I don’t want extras hanging around the house or I’ll eat them too. My family inhaled these. So yummy!